Thanksgiving. It's a time of year to be with family and friends, maybe enjoy a great meal or two and reflect on the things in life we appreciate the most. Normally we don't say grace and thankyou until our thanksgiving supper, which usually happens on a Sunday, but this year I said my thanks on the Saturday night. 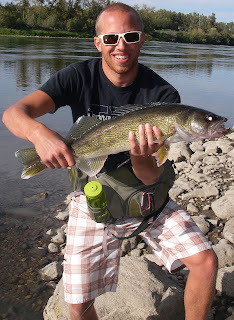 The North Saskatchewan River is basically the only flowing water in the Edmonton area which is worth fishing and sometimes it can be exceptional and produce truly amazing fish. It is a relatively healthy ecosystem. Mayflies, caddisflies, and a host of other insect hatches occur. There are many species in the river as well. 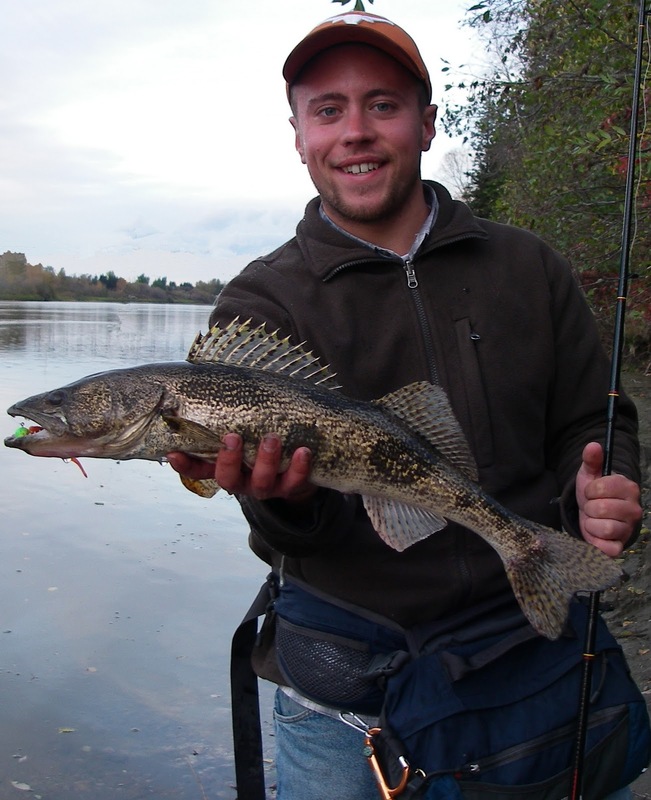 Walleye, Northern Pike, Goldeye, Sauger, and Sturgeon being the most popular target species. 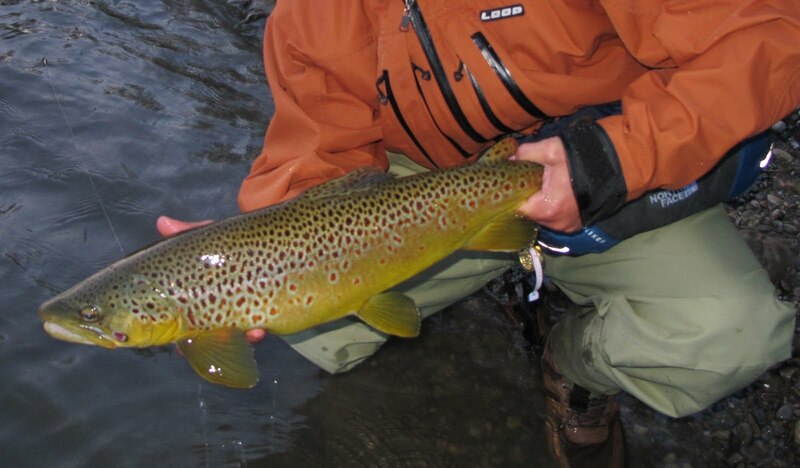 This year we had exceptional dry fly fishing in August and September for the goldeye and mooneye. Things slowed down a bit on the surface after the backswimmers and water boatmen blanketed the bottom of the river. That's when it became gear chucking time. Friday of the Thanksgiving long weekend my dad and I headed to the river and had some great fishing. On just his second cast he claimed to have a nice walleye on. When it came up, I couldn't believe my eyes. He did have a big fish, but it wasn't a walleye. 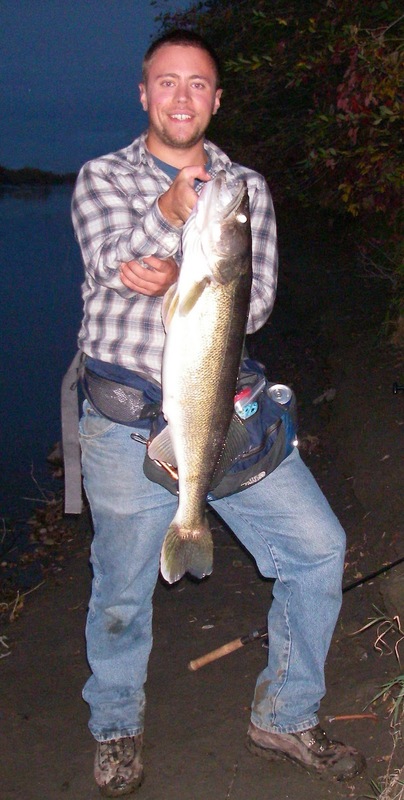 It was a close relative to the walleye known as the Sauger. These things look very neat. They have mottled sizes and are usually more dark brown in colour with no white tip on their fin. Sometimes they remind me of small rock fish from the ocean! Typically the sauger I'm used to catching are in the 1lb-1.5lb range. This thing was a beast! It was by far the biggest sauger I have ever seen. According to our measurements it was just under 5lb! A truly great catch and not too far off the Alberta record of 6lb 12oz. The next evening we went fishing after a hard days work and sighting in rifles on the farm. I slammed into a really good fish on my second cast. I landed a really good walleye about 5 years ago in the river and after landing a large walleye, you know how they feel versus a smaller one. The hit feels like a tap on your lure and when you set the hook, it's like setting into a thumping log. My rod was bent to the handle and at times it felt like I was bringing in a tree off of the bottom. You MUST have your drag set right when playing a big fish like this. If it's too tight, the barbless jig might simply pull out of its mouth or your line could even break. If it's too loose, the fish could shake the hook or it could simply just slip out of the fish's mouth. After a couple a minutes of bulldogging on the bottom, we finally got a glimpse of it. I knew it would be big, but didn't anticipate it would be this big! I quickly subdued it when I could finally reach out and grab it and dad grabbed the camera. Finally after losing a fish or two like this over the last few years, I brought one in! It was my biggest walleye since 2006. The fish was a touch over 32" with an 18" girth. A solid 12lb + beast. I am not sure I got the girth measurement in the right spot because if you examine the picture closely, the fish appears to have either a sucker or a goldeye in it's stomach! What a fish! I gently released it and she went back down into her lair. I was shaking with excitement and celebrated with some cold ones in the garage and some George Jones with my dad. Now that is something to be thankful for and it was truly my best thanksgiving weekend to date! I normally wouldn't make the treck out to BC on a regular 2-day weekend but it was the end of September and the weatherman said 30 degrees celsius...So I left! Besides that, a group of friends were going to be out there already and back from Montana with a cooler full of Miller High Life and Coors. I ripped out to Fernie right after work on Friday, hoping to make it out in time to have a few cold ones and set up camp with them. The following day we had some really good fishing for cutthroat trout in the nice weather, including a pleasant surprise of a stellar blue wing olive hatch and some beautiful fish on dry flies! The following Sunday I had planned on doing some fishing for half a day and then ripping home in preparation for work the following Monday. I went to start my car....no response. "You gotta be kidding" I thought to myself. Luckily my friends were there to take me into town to get towed because we were camped where there was no cell phone reception for miles. To make a long story short, the part was going to take 3 days to come in (new fuel pump) and I was stuck with barely and camping gear. I set-up my tent at the campground near where I was getting my car fixed a couple a miles outside of Sparwood. With no vehicle, no stove, no cooler to store food and a leaky air mattress, I looked at my last can of beans and went into survival mode. As luck would have it, the weather had taken a turn for the worse and winds were gusting like mad with an obvious rain/cold front rolling in. "How am I going to maintain my sanity out here when my tent is blowing around in these winds and it's pouring rain?" I asked myself. The first day I hiked into town to get some food and a few supplies from the bargain shop. All I had for a backpack was a kokanee beer cooler bag so I definitely looked like I lived in a tent. Even though it was a long walk, I decided I would buy a fishing license for the next two days for something to do and keep me sane. Turns out it was a pretty good choice. That night I barely slept. Cold winds kept threatening to blow my tent down as the rain pounded away. The next morning I loaded up my bag, threw on my wading boots and 2 jackets, loaded my life on my back and trecked to town for breakfast. Note: chewing tobacco first thing in the morning helps kill your appetite if you have to walk a few kilometers on an empty stomach to get breakfast! I ate as much as I could at the A&W and headed out when the rain lightened up. I made it down to the river hoping the rain didn't dirty the river up too much. The water looked slightly higher, but not off colour. I was excited. I did what any hobo would do and hid under the bridge while the rain came pounding down. Threw out a nymph and hooked into a nice trout, first drift! 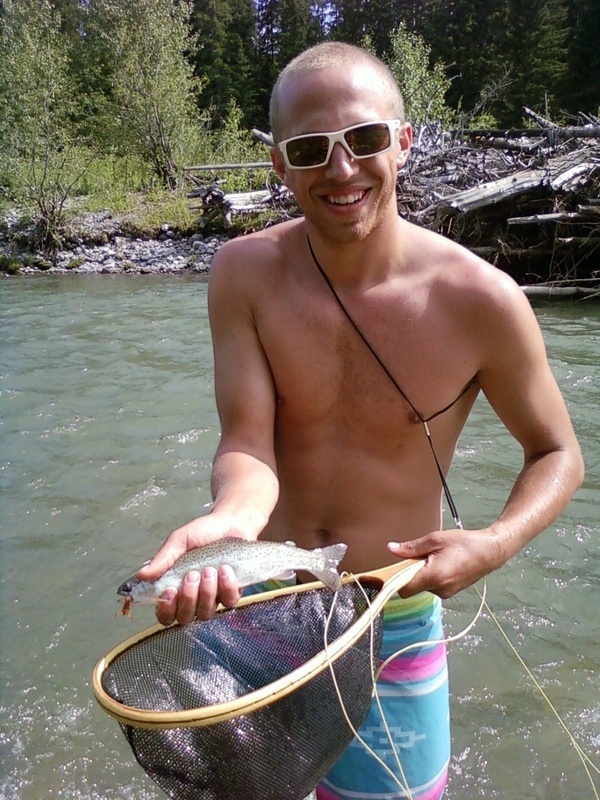 The cutthroat appeared to be a fat 17" fish, typical of the Elk River. All of a sudden this fish took a huge run off my reel and felt like a 10lb fish. Under the bridge I could see, much like a shark, a massive bull trout had this big cutthroat by the head! This really got my adrenaline going! I brought in the cutthroat when Mr. Bull Trout dissappeared back into his lair and decided to change my set-up from using a small fly to throwing a streamer. I threw on a big fly my buddy Jake tied for me that works awesome for bull trout. If anything was going to get this leviathan to hit, this 6" + beauty was the fly. I threw it into the run and felt a few taps and saw a chase while I stripped it in quickly. I decided to just drift the fly through and let it swing. Sure enough, on the swing, the bull trout hit! Well, not THE bulltrout but a bully anyways! It was about a 20" fish or so and a nice surprise. I never caught that big bully but had a great day and was able to do some hiking up river when the rain let-up. That day I fished hard and kept count of the number of fish I caught. 3 bull trout, 24 cutthroats and 23 rocky mountain whitefish was the total for the day. Normally I don't keep track of numbers, but being by myself I decided to try for a 50 fish day. Overall, it was an amazing day and took my mind off of things back at my tent. As I hiked off the river through some thick bush towards the highway I stumbled over an elk carcass. Being by myself I was scared sh*&less especially after seeing blood spots on some leaves in the area. I put in over 20 km of walking for food and fishing that day, but it was worth it. The next day I tried to catch the big bull trout again, but came up with a smaller one on the swung streamer. Still a beauty fish of about 5lb. These fish are truly remarkable and hard line pullers. To end the day I decided to try a dry fly to catch my last fish of the trip on. I went to a spot that barely flows and looks merely a shallow bath tub of foam. All I could see was a slight sipping motion from a cutthroat trout's mouth under the foam...a fish most people would walk or drift right past. I hitched on a #18 mayfly onto some 3.5lb tippet due to the size of the mayflies hatching and the calmness of the water. All I could see was the calftail post on my parachute mayfly sticking out of the foam. All of a sudden this little burble came under my fly or at least where I thought my fly was. I waited a half second, lifted my rod and BAM! This was a good fish, too good for the light tippet and he was ripping me into the current! Oh no! I played it just right and brought it to net . It turned out to be the biggest cutthroat of the trip. A 20" beauty on a dry fly! What a way to cap off the day. Actually, a 20" trout on a dry fly AND a beer before the long treck back to my tent, that's a great end to the day! So the car repair cost me $1000 and I developed a reputation as "a hobo fisherman living in a tent outside of town", but I made the most of my stay. it was truly great fishing and I made it home alive! Plus the lady at the bargain store gave me free body wash so I could "wash-up". 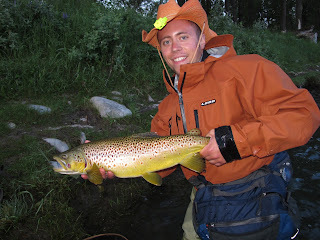 The only thing better than that big cutthroat trout was finally having a shower and changing my clothes! We always seem to go far away from our hometown for fishing and other adventures, but sometimes the best fishing is right in our own backyard. A few weeks ago, Nick, Andy, and I headed down to the North Saskatchewan River in our hometown for some Goldeye fishing on the fly. Some of you might think I am making up the name of a fish, as a lot of people I have talked to around Edmonton don't even know what a Goldeye is. A Goldeye is a member of the shad family with huge (you guessed it) golden coloured eyes. that can grow in excess of 20"+ in size. They feed aggressively on anything from nymphs, dry flies, and even minnow fly patterns. On this evening, we used all of the aforementioned flies, and did quite well on all of them. Another fish called the Mooneye was caught, which is similar to the Goldeye, but is smaller in size, and has blueish silver eyes. We made it down to one of our usual spots at first, but the Goldeye weren't really showing themselves. After a few frustrating casts with grass behind us, we headed upstream through some mud. Passing some old bicycles and shopping carts that had washed up on shore, we found the first of a few pods of rising Goldeye. 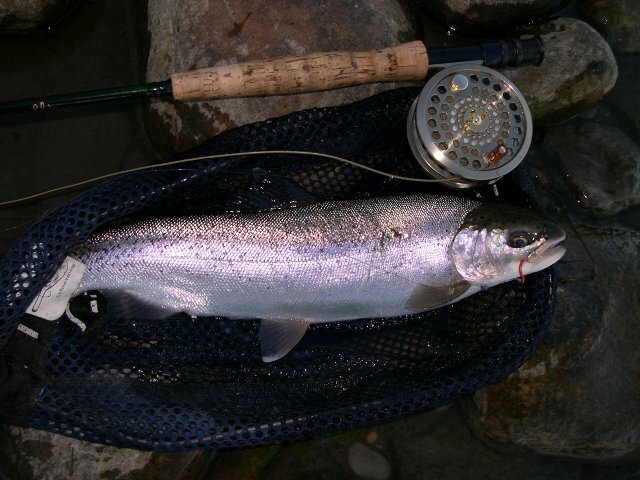 Nick used a classic glass fly rod, and got some sweet bends on it with some hookups on the dry fly. Andy used mostly nymphs, and I used nymphs, dries, and streamers. A local outdoor writer used to call Goldeye by the name of "Chrome Hubcaps", and that is what has stuck with us. We added that if you catch one over 20" it is a Chrome Rim. The scales are very bright and large, and the fish get quite fat. We didn't get any Rims on the night, but some were close in size! After we caught a few on dry flies and nymphs, it began to get dark. I switched to a Clouser Minnow pattern to see if I could get an aggressive strike. Within a few casts of stripping the fly in aggressively, a Chrome Hubcap of about 17" slammed the streamer right by my feet and ripped line out into the current. What a rush! We fished until dark, and had to climb a very steep sand hill to get up out of the spot we were fishing, but it was all worth it for a great night with good friends and some fun fishing right in our own backyards. That hill wasn't as easy to get up as it used to be though! This is my first Journal entry, so hopefully it goes well lol. I will start by saying that my July was a whirlwind month, but well worth it! I started off the month by catching some nice walleye on an outing to Calling Lake and Baptiste. Now the one pictured below is not as big as Andy's 13+ pounder that he landed on the North Saskatchewan River a few years ago, but it put one hell of a bend on a light rod. If its body had filled out for the size of its head, I can't imagine what it would have weighed! Either way, it was a great way to start the month. The next weekend, the guys and I headed out to Central Alberta for a Stag in my honour. We did some fishing for Browns and Brookies on a creek, and drank a whole lotta liquor back at camp. We had some great neighbours at camp that would keep bringing beer if Andy, Steve, and Nick kept playing tunes on the guitar too, which is always a bonus...the only problem was it was Boxer beer. By the way, is that what everyone in Central AB drinks? It sure seemed like it! All in all we had a great time out in the woods, and it was a great way to send me off to marriage...which was the next thing to happen in July! After getting married on July 23, my wife Tara and I went off camping to Southern BC. 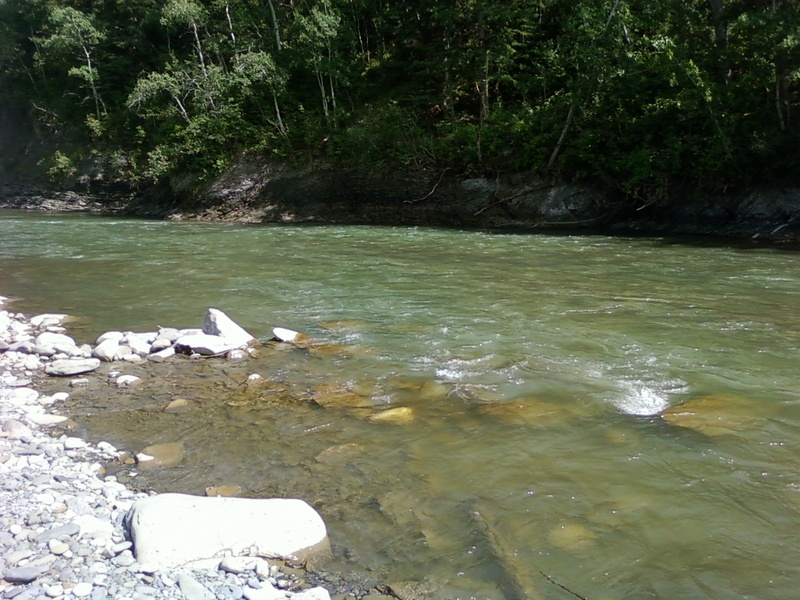 Our first stop was the West Kootenays where we fished a small tributary creek. Tara always seems to have great luck out fishing, and that day was no exception! She caught all species of trout in the creek (Brook, Cutthroat, and Rainbow). I landed Brookies and Cutts. We were allowed to keep 2 trout each on that creek. Being primarily a catch and release fisherman, I normally don't keep trout often; but when there are 10-12" Brookies in the creek, we were definitely keeping those for a fry! After a couple of relaxing days on the stream, we headed to Champion Lakes near Trail, BC. The drive was scenic as we took the winding road past Creston, the ferry across Kootenay Lake, and the hills past Castlegar. Arriving at Champion Lakes, the weather was fantastic. We did some floating around the lake on blow-up matress-type things. Tara had a great idea to do some fly fishing off of them, so I said: "Sure, if you catch some, then I will do the same!". Within minutes she had a few rainbows on, and I was out there joining her for some fun action on the 5 wt and intermediate sinking line. The rest of the trip went well, with daily temperatures exceeding 30C, and no rain to ruin a great vacation. It would take me awhile to write on the rest of the trip, so instead, I will post a few more pictures here for your enjoyment. We still have a few more awesome trips planned for the year, and hopefully more great pictures come from them! Hi all, we have just started up this Journal as we are hoping to use it as a place to post fishing reports, pictures, and any other useful information that we normally wouldn't cover on our main website. We have replaced the "Pictures" section on the website with this since it will be much easier and quicker to get our pictures on here and show them to you folks, instead of the gallery formats we used before! Hopefully you all enjoy this blog as much as our website and forum. And from all of us here at WesternSportfishing.ca, thanks for your continued support!